Victaulic is looking forward to introducing the NEW FireLock® NXT Series 768N Dry Valve at this year’s AFSA Convention and Exhibition: Rising to Excellence in Phoenix, October 10-13. We sat down with Victaulic product manager, Daniel Wake for a sneak peak at the new product’s features and benefits, how this innovation will impact the fire protection industry as a whole and why this new technology is important for AFSA attendees. Daniel, what is your current role with Victaulic? I am the product manager for sprinklers and fire protection devices which include NXT, dry, pre-action and deluge valves, as well as some other specialty fire protection valves and systems. Describe the new NXT Series 768N Valve; specifically touching on the installation, maintenance, and set-up benefits. The entire idea of the redesign was to make the valves much more intuitive for the average fitter who may or may not have used the products before. We simplified the design and layout so that air is on the left-hand side and the water is on the right-hand side of the valve for the pressure gauges and pressure switches installation. Victaulic has always sold customers on the premise of the installation and set-up being as easy as ABC and we have been able to encompass that same mentality into the new design of the NXT system. Additionally, we have simplified the maintenance by listening to what our customers were saying and addressing points of frustration. The main concern we addressed was fitters switching the strainer cartridges for the air and priming manifolds. Now we have engineered in different thread sizes for each so there is no chance of mixing them up. Secondly, we repositioned the pressure switches ensuring vertical installation and making them more accessible. 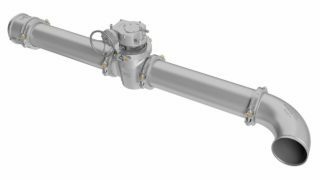 We also simplified the trim down to three manifold components – the air, priming and alarm manifold – maintaining the core features and benefits while not taking away from the operation of the valve itself. The new 768N Valve is scheduled for release mid-October within the U.S. and Canada, prior to launching globally. It is important to note that the overall features and benefits we pioneered back in 2005 with low air pressure, single set points, smaller compressors, and pre-set pressure switches for ease and speed of installation have certainly been kept within the new and improved design of the NXT. For us, being able to continue to have those features and benefits in the new product will only help add to the adoption and the understanding for current customers and any new potential customers for the way the valve operates and functions. How does this new product compare to similar products on the market? Competitors? Ten years ago when we came out with the original NXT we created a concept called the Victaulic Quick Riser, where the valve came almost completely assembled in its’ box. Over the years competitors have adopted some of that idea by partially and almost completely assembling their dry valves as well. Rather than having everyone catch up, as part of our re-design we decided to reduce the trim down to make it a simpler, lighter valve and also have less components to install once it arrives. How would you describe the updates overall and how it will impact the fire protection industry? Updates overall, we believe, will make a big impact in the industry. It has the same look as our original valve, which could be daunting to some technicians when they see it for the first time – but by simplifying it down and making the areas that you need to address for the set-up much more intuitive – we believe it’s going to be a great step to increasing the acceptance in the industry. Sprinkler fitters are going to know by simply looking at it what they have to do. We moved the actuator to the front making it more reachable and put the priming water on the system – down on the right-hand side, in an area that is very accessible. Describe your past as a fitter and how it translates your experience at Victaulic. Victaulic is dedicated to listening to and understanding our customer, and a good example is bringing in talent that has worked in the field previously. I came out of that business approximately 6 years ago and have a clear understanding of what it takes and what goes through the minds of the sprinkler fitters in the industry. For example, I know fitters are not going to take the time to read a 40-page installation, instruction and operational manual when installing a product. If it’s not in a single-page or a very easily found, it’s difficult to get fitters to read through extensive instructions on a product, how it installed and set up. We have been able to do something on our new valves that we think is going to revolutionize the industry when it comes to instruction and operational manuals and that is inserting QR codes on the front of each of our valves. The QR code will allow fitters to quickly access short videos on installation, set-up, and maintenance; complete installation instructions; and access technical help with the push of a button (direct call to 1-800-Pick-Vic). Facilitating this kind of access to information and resources shows how committed Victaulic is to our customers. What value does Victaulic bring that other manufacturers don’t? The incorporation of the QR code onto the valve was an important way we could support our customers like no other manufacturer can and is going to change the way people think in the industry. Aside from incorporating the QR code onto the every day valve, the NXT line in its’ simplicity, has allowed a new direction in how dry, pre-action and deluge valves operate. Our engineering team has produced simple, well thought-out designs for the manifold components, which allow the valves to be easy to service and maintain. Victaulic’s renowned high quality standards give customers confidence in what they are installing. What are you most looking forward to at AFSA? The AFSA Convention this year looks to be a big convention. They did a great job in Orlando last year and I am looking forward to seeing the same large turnout this year. This show is an incredible space for sprinkler fitters and contractors as well as some of the leaders in the industry. I’m looking forward to seeing familiar and new faces alike and being able to introduce them to this new technology we’ve been working really hard on. It’s always better to see new products in person, so I’m excited Victaulic gets to familiarize the AFSA attendees with the new FireLock NXT Dry Valve in Phoenix! To learn more about the new product visit Victaulic at AFSA booth #501!